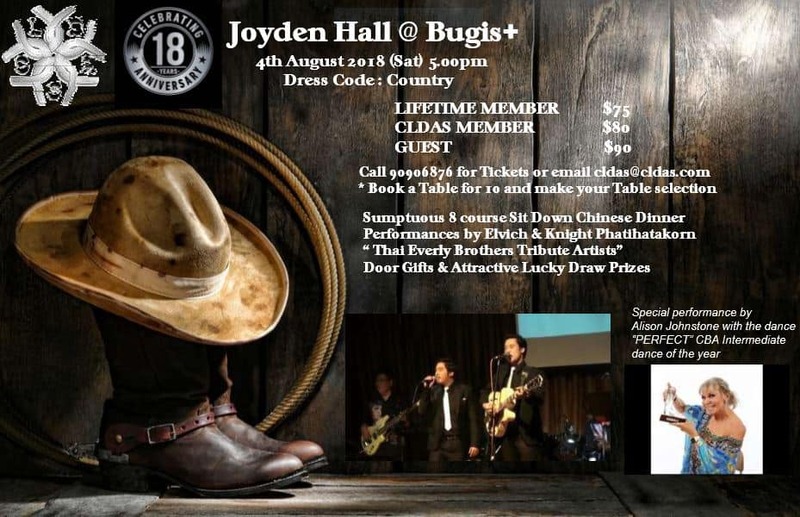 Before you knew it, our Annual Dinner & Dance is coming again on Saturday, 4 Aug 2018 at The Joyden Hall @ Bugis+. We’re back to our roots with a Country & Western theme this year to celebrate the 18th anniversary. Come listen to your favourite hits of the Everly Brothers from Thailand; and watch the award winning performance by Alison Perfect Johnstone from Australia. Not to forget the attractive lucky draw prizes, door gifts and exciting party games. If you book a whole table of 10 tickets, you can pick the table of your choice from the layout plan on a first-come-first-serve basis. Call or meet us at our regular jam venues at Paya Lebar Square, Zhongshan Park, and Eurasian Community House to reserve your tickets. Check out the D&D 2018 flyer for more details.